As I'm sure you could figure out (if you ever thought you had to) that an island country in the south pacific is quite small with very little manufacturing. Because of that, we have to import most things and they are, of course, more expensive than locally made items. 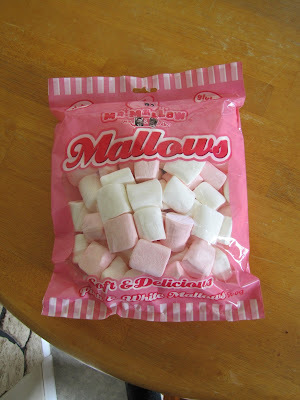 I believe I am getting used to that fact--after almost 7 years, it's about time, don't you think?--but, I must confess that I was shocked at the price of this 16-oz-ish package of marshmallows that Hubby put in the cart trolley a few days ago. 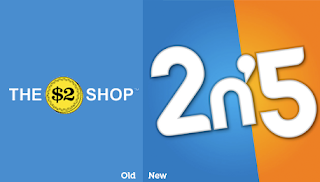 We pay just over $2/liter for gas petrol. *pause to let you quickly calculate a general idea of a price per gallon* I could go to all the trouble of figuring out our gas mileage--or is it kilometerage? no, it's mileage, at least it is in England where they measure in miles but buy in liters, but I digress. Anyway, we just try to limit our number of trips 'to town' (which would be Hawera or New Plymouth, each about a 30-minute drive) each pay period. I have to admit that I miss all the different dollar stores in the US. I could visit four or five in Topeka in one day looking for cool stuff to buy for a dollar. When I first got to Stratford, we had a $2 shop. Stock changes all the time, so it's an adventure to buy one specific item. But most towns had a $2 shop so I could pop into each one I passed to look. I suppose I will be 'shocked' by prices going up in the future as they will all over the world, but I imagine my sentences beginning with, 'Well when I was in Kansas, I could buy that for...' will lessen eventually. But I don't think that the Kansan in me will ever go away. Peanut butter is the thing that gets me. I expect certain US faves to be expensive in fresh form... like blueberries or raspberries. And I expect beef to be expensive too as there isn't much cattle crazing in the desert here, but peanut butter can be harder to find, and $10+ for a little jar. (Not so bad in Kuwait, but still expensive). that cheap gas in their gas-guzzlers is part of the climate change denialists fuel. We also pay heavily for our fuel, and town, Cape Town, is 2 hours each way. Food prices in Canada have skyrocketed. Things are so expensive I now search the flyers an try to buy only what is on sale. This has happened in the last two years. Yes, I can believe you pain $4.41 for the marshmallows. Things are cheaper at our Walmart though. My sister moved here from Nevada and food prices make her terribly upset. the sad thing about progress is that the price of living is going up. 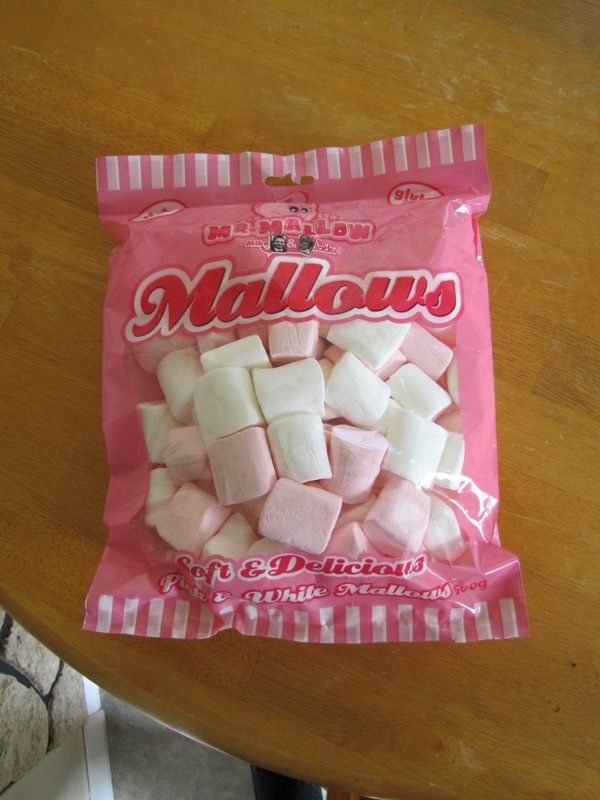 The only time we buy marshmallows is when we go camping - so we can toast them over the campfire after dinner. I don't look at the price - I just buy them - because what would be camping without toasted marshmallows! Yes - we had marshmallows! I haven't moved out of the country, but I did go from South Florida with warm weather, a bustling economy, low taxes, and lots to do, to very rural Michigan, with street lights that start blinking at dusk; taxes in the form of city, state, and federal, and cold weather. It's been six years now and I'm still adjusting. Well, I guess I'll just stay here in Arkansas. Sometimes we just don't know how good we have it, do we? Thanks for reminding me! Oh, my goodness-you are so brave and so neat! I just don't know how you made this big move!! Bravo! I am amazed that you have been here in NZ now for seven years! I think that I have been reading your blog for almost that long. Yes its expensive here.I do get upset when I see imported fruit and at an exorbitant price - we should just have local fruit that is much fresher. It does your heart good!